While the focus of this 12-song collection is clearly "presentation of songcraft," MANNERISMS MAGNIFIED is heavily propelled by Turner's nuanced fretwork (acoustic and electric guitar influences that include the aforementioned Buckley and Smith, along with Steve Morse, Tommy Emmanuel, John Frusciante, Ani DiFranco, Ty Tabor, Andrew York, Jimi Hendrix, and Jeff Beckmany of whom Turner has had the privilege of conducting interviews/private lessons with at his former "job") and wide-ranging vocal approaches (from eerie whispers, dreamy falsetto, and stunningly-intricate harmonies, to full-throttle rock wails, cartoon-like voices, and throat singing effects). 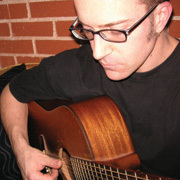 Over a decade ago, various hand injuries (Carpal Tunnel and Tendinitis, among others) prompted Turner to abandon various aspects of his guitar style (fast playing, most string bends, and certain other aggressive fret-hand moves) and focus intensively on songcraft, morph his six-string statements into something more orchestral/piano-like, as well as develop his varied vocal interests. 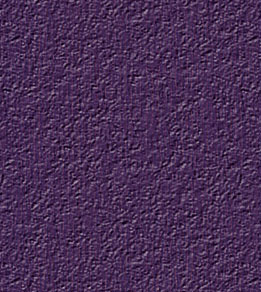 This first resulted in 2004's INTERPRETATIONS (a live guitar-and-vocal only covers album done as a tribute to Jeff Buckley). On the all-original MANNERISMS MAGNIFIED, all songs (with the exception of the multi-tracked a cappella opening cut, and Brian Wilson homage, "Brian on the Brain") still feature acoustic guitar and voice as their foundation (the manner in which Turner currently performs them live, as a solo act), but have been augmented in the recording process with Turner's subtly unorthodox drumming (self taught by transcribing Red Hot Chili Pepper Chad Smith's drum parts, studying Steve Smith's instructional videos, and various drum instructional books), linear-yet-supportive bass playing (influenced by Flea, first and foremost, along with Victor Wooten, Jaco Pastorius, and Carol Kaye), and, of course, Turner's vast array of electric guitar sounds. 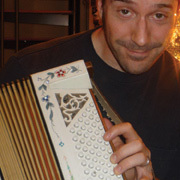 Add to that, Turner's piano, mandolin, and accordion touches on select cutsand the fact that virtually any other instrument heard is actually a vocal sound (think: Mike Patton meets Bobby McFerrin meets Raul Midon)and you get a hint of the unpredictable, yet highly-musical listening experience this 42-minute sonic journey offers. 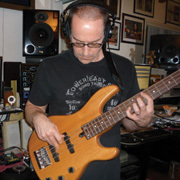 MANNERISMS MAGNIFIED was initially mixed on a Power Mac G4 by Dale Turner, then remixed (from stems) through vintage/modern analog gear by sonic wizard Robert Wawoe. Mastered by Eddy Schreyer (Jon Brion, Fiona Apple, Take 6, Korn, Queen) at Oasis Mastering. CD/DigiPak includes original art/illustrations and complete lyrics booklet. 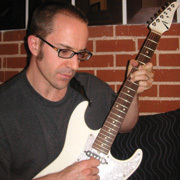 The former West Coast Editor (1996-2007) of the now defunct Guitar One magazine, in addition to working as a performing/recording musician and producing engineer, Dale Turner is an instructor at Hollywood's Musician's Institute (where he teaches Jimi Hendrix-style rhythm guitar improvisation, music theory/ear training, sight-reading, and rhythmic independence for the singing guitarist), and author of 50+ instructional books/transcription folios (his latest being Power Plucking - A Rocker's Guide to Acoustic Fingerstyle Guitar). 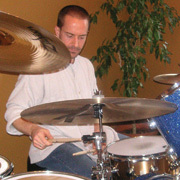 He also writes a monthly acoustic guitar column for Guitar World magazine, and is featured in their Lick of the Day App. for iPhone/iPad. An intimate recording of solo arrangements for acoustic guitar and voice10 inventive versions of cover songs ranging from Queen's "Bohemian Rhapsody" and the Beach Boys' "God Only Knows," to Jimi Hendrix's "Castles Made of Sand" and Nilsson's "Coconut," all recorded live in a bedroom/office (played and sung simultaneously). Dedicated to Jeff Buckley. Here's a little page where you can check out some ULTRA-RAW live recordings of your silly site host, Dale Turner, yodeling and strummin'. Mind you, none of these performances are great, they're merely experimentsyour site host testing out some new, atypical numbers (acoustic guitar & vocals) in front of real human beings. Please don't condemn him for the occasional sluffed chord or his sometimes out-of-tune tenor! Consider this section for entertainment purposes only! 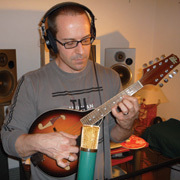 With Unassigned Territory, guitarist/composer David Pritchard expands upon his unique approach to acoustic guitar music which was debuted in his last recording, Air Patterns. On Unassigned Territory he is joined by fellow acoustic guitarists Dale Turner, Joseph Jewell, and Jack Majdecki. In addition, the guitar quartet is joined on three cuts by vocalist Teri De Sario. A musical tribute to the victims of September 11, 2001. Fresh musical interpretations of 10 Christmas classics, available for free MP3 download: "Rudolph the Red-Nosed Reindeer," "Little Drummer Boy," "Jingle Bells," "Up On the Housetop," "White Christmas," "Hark the Herald Angels Sing, "God Rest Ye Merry Gentlemen," and more! 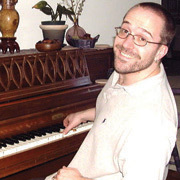 Instruments used include Kalimba, kazoo, nose flute, ocarina, and numerous unique percussion and voice effects.